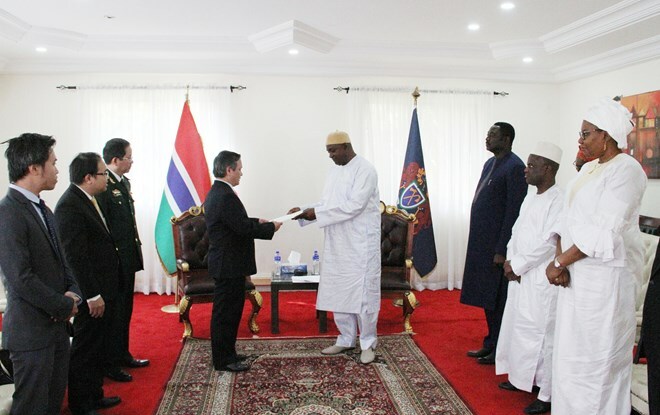 Algiers (VNA) – Vietnamese Ambassador to Gambia Pham Quoc Tru presented his credentials to President of Gambia Adama Barrow on April 16. At a reception after the presentation, President Barrow said he hoped the ambassador would contribute to developing the two countries’ diplomatic ties. He praised Vietnam as the flag in the struggle against colonialism and congratulated the country on its socio-economic achievements in the Doi Moi (reform) period. The president expressed his desire to strengthen collaboration with Vietnam in various fields such as trade, investment, agriculture, healthcare and education. Gambia also wants to learn from Vietnam and have more Vietnamese investors do business in the western African country, he said. The president said both countries should push ahead with negotiations and early signing of agreements to create legal frameworks for stronger bilateral cooperation such as deals on double taxation avoidance, investment protection and encouragement and visa exemptions for diplomatic and official passport holders. He suggested the two nations increase support and coordination at international forums and reiterated Gambia’s support for Vietnam to become a non-permanent member of the UN Security Council for the 2020-2021 tenure. Ambassador Pham Quoc Tru conveyed Party General Secretary and President Nguyen Phu Trong’s regards to President Barrow, and thanked the Gambian government and people for their support for Vietnam. He affirmed that Vietnam attaches great importance to and hopes to enhance traditional relations with Gambia, especially in fields of their strengths such as agriculture, marine economy, tourism and trade.